The Valley is getting some respect from CicLAvia. We&apos;ve seen the popular bike festival make its rounds through different parts of L.A. for the past four years, but the event honchos have announced that they&apos;ll be hitting the San Fernando Valley for the first time come spring 2015. The people behind the fest, which blocks off streets so bikers and pedestrians can ride freely without any cars in their way, are still working on the nitty gritty details—like the specific date and which route to take, according to the L.A. Register. And it doesn&apos;t look like this is going to be a one-time thing. Gard also said that the group hopes to throw one in the Valley every spring. 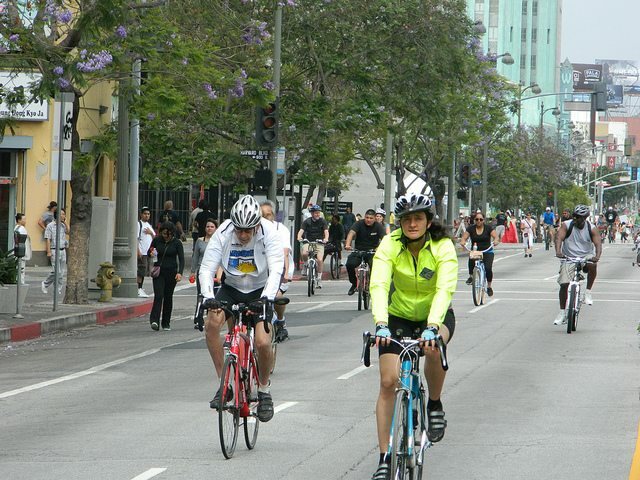 CicLAvia just had its first ride of 2014 on Wilshire Boulevard in April, but there will be more chances for you to bike on some sweet, empty streets in our city this year. One is the "Heart of L.A." route on October 5 that goes through downtown, Echo Park and East L.A., and another is the brand-new route in South L.A. on December 7. Eds. Note: Gard got in contact with LAist and let us know that there were errors in the story which we have since corrected.